NextBank claim to be the world’s first Bitcoin friendly bank, has a mission to provide advanced banking services for cryptocurrency users and say they will make no difference between the fiat and crypto currencies. The operation, registered with Vanuatu Financial Services Commission, plan to launch in early 2016. 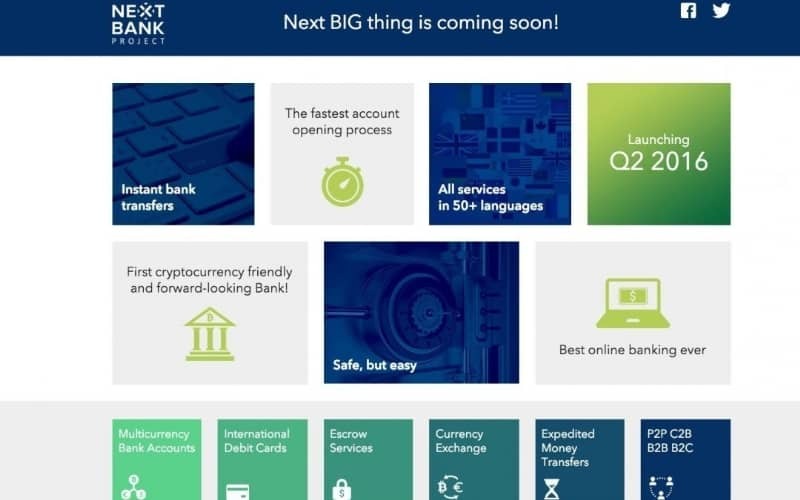 Nextbank say they will offer international Debit Cards, accounts denominated in fiat and Bitcoin, SWIFT transfers, an escrow service, currency exchange, and much more and their currency conversion charges will range from 0.2% (popular currencies) to 0.4% (less popular currencies) which is well below banking rates of 3-5 percent. Furthermore, NextBank say they will offer cryptocurrency and precious metals on single multi- currency accounts. Accounts will support over 135 currencies and precious metals. Bitcoin, Litecoin, USD, GBP, gold, silver, platinum and palladium in one account within one bank. And users will also enjoy up to 60 months without any storage fees. NextBank will assist clients in 50+ languages and plans to launch seven offices worldwide in 2016 in the UK, France, Germany, Spain, China, Malaysia and Russia. NextBank will make financial procedures less complicated for the Bitcoin community offering private or business accounts for cryptocurrency operations. Users can open account in less than 90 minutes. In most cases it will be enough to provide a passport, utility bill and fill out a short application form. Photocopies are accepted and originals are not required. After successful documentation upload, applicants will have a virtual interview (10-15 minutes). Clients will receive account details, online banking and a unique access code, to help generate one-time passwords before the end of the interview. NextBank is independent from any financial institutions. Anyone has a great opportunity to take part in the cryptocurrency revolution and become a NextBank shareholder. One stock share price is $100. There are 250000 stock shares. As a result, investors will receive 1/250000 of NextBank profits. Dividends will be paid in fiat currencies or Bitcoin. Furthermore, there are many different bonuses for shareholders. For example, priority account opening, priority application processing or up to 60 months free-of-charge banking.